Yes, we have been in Tucson a full week and have been sick most of it. I think we are both finally getting better. My ribs hurt from coughing and blowing my nose so much. Naturally, now that we are getting better the weather is getting worse. Every day we have been sick the weather has been beautiful with highs in the mis-70s. Today, it has been very windy, mostly cloudy and high of maybe mid-60s. The pictures in today’s blog were taken when we first arrived here. The desert here is very different from the desert at Quartzsite; it has many more plants and birds. My first morning walk I saw more species birds than I saw birds in Quartzsite. There are many different kinds cactus and plants. 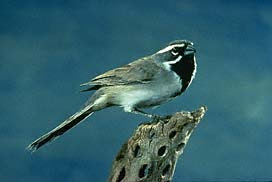 New to this year’s bird list was the Black-throated Sparrow. We got here the day before our friends Fred & Jo Whishnie http://www.mytripjournal.com/wanderingwishnies left so we got to spend a little time with them and catch up. Also here when we arrived were Jim & Ellie Meacham http://justravelin.blogspot.com/ , you might remember we met them in Paso Robles our very first night as fulltimers. New people we met the first day we were here are Doug & JoAnn Dubrouillet http://mytripjournal.com/ourdream . Although we had never met them before I have been reading their blog since May of last year. This coming weekend all six of them are caravaning down to Mexico for a few weeks. Before getting sick we were able to get a few errands taken care of. One of these was to go the Wild Birds Unlimited http://www.wbu.com/ and get a new pole for our bird feeders. It is near impossible to pound a conventional feeder pole into the rocks of the desert. The new pole has a stand with a 24 inch diameter to support it. We were also able to make a stop at Bookman’s Used book store http://www.bookmans.com/ it is the largest, busiest, neatest used bookstore I have ever seen. Kathy wanted to pick up a few books in a series of mysteries, they had them real cheap! Glad to see you are feeling better and finally in good bird country! I always made a point of going to Bookmans when I was in Tucson. Isn't it a great store!! Take care of those colds. Glad you're feeling better.